Dr. Mitchell is Associate Professor, Dr. Puskar is Professor, Ms. Talcott is Project Manager, and Dr. Fioravanti and Dr. Kane are Assistant Professors, University of Pittsburgh School of Nursing, Dr. Terhorst is Statistician, Community Care Behavioral Health Organization, University of Pittsburgh Medical Center, Pittsburgh, Dr. Hagle is Director, and Dr. Luongo is Executive Director, Institute for Research, Education, and Training in Addictions, Dr. Hulsey is Public Health Consultant, Pittsburgh, Dr. Burns is Chief Nursing Officer, Excela Health/Latrobe and University of Pittsburgh School of Nursing, Pittsburgh, Pennsylvania; and Dr. Gotham is Associate Research Professor, School of Nursing and Health Studies, University of Missouri-Kansas City, Kansas City, Missouri. Dr. Gotham discloses project support from the University of Pittsburgh through a contract to the University of Missouri, Kansas City, and Dr. Hulsey discloses funding support from the University of Pittsburgh. Dr. Mitchell, Dr. Puskar, Dr. Hagle, Ms. Talcott, Dr. Fioravanti, Dr. Kane, Dr. Luongo, and Dr. Burns have disclosed no potential conflicts of interest, financial or otherwise. This project is supported in part by funds from the Division of Nursing, Bureau of Health Professions (BHPr), Health Resources and Services Administration (HRSA), U.S. Department of Health and Human Services (USDHHS) (grant D11HP14629). The information or content and conclusions are those of the authors and should not be construed as the official position or policy of, nor should any endorsements be inferred by, the Division of Nursing, BHPr, HRSA, USDHHS, or the U.S. Government. Address correspondence to Ann M. Mitchell, PhD, RN, FAAN, Associate Professor, University of Pittsburgh School of Nursing, 3500 Victoria Street, 415 Victoria Building, Pittsburgh, PA 15261; e-mail: ammi@pitt.edu. In current nursing curricula, little education and training is devoted to providing care for substance use, abuse, and dependence. Mollica, Hyman, and Mann (2011) examined the didactic and clinical hours of instruction on alcohol and other drug misuse offered in 27 baccalaureate nursing programs in the northeastern United States. Although all responding schools indicated some instruction related to alcohol use, few curricular hours were dedicated to didactic and/or clinical education on alcohol and other drug use. Moreover, only one school reported content integration across the curriculum, rather than solely focusing content within the psychiatric-mental health nursing area. Mollica et al.’s results were similar to studies conducted 2 decades ago (Hoffman & Heinemann, 1987; Howard, Walker, Walker, & Suchinksy, 1997). 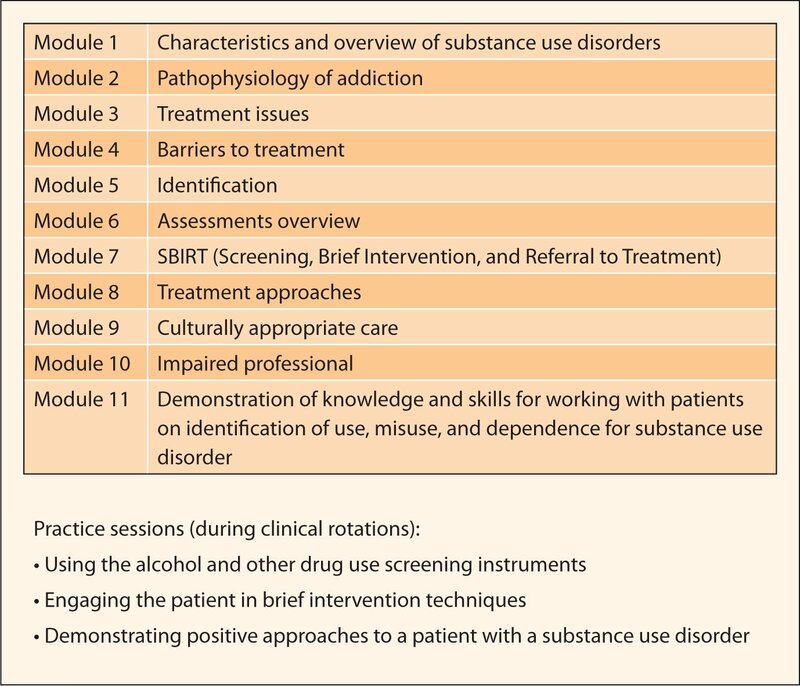 The limited number of substance use content hours in nursing curricula throughout the United States suggests a cycle in which nurses who lack the knowledge and skills to provide appropriate care inadvertently contribute to the low proportion of those seeking and receiving needed care due to lack of education. The current article responds to Mollica et al.’s (2011) call for nurse educators to “address the preparation of new nurses for societal health problems” (p. 30). The aims of this article are to: (a) describe a didactic and clinical Screening, Brief Intervention, and Referral to Treatment (SBIRT) for alcohol and drug use education and training program embedded and threaded throughout an undergraduate nursing curriculum, and (b) provide results of undergraduate participant training satisfaction surveys and SBIRT skills competency ratings. Each year, approximately 23 million Americans meet diagnostic criteria for a substance use disorder (abuse or dependence), yet only approximately 10% actually receive substance use treatment (Substance Abuse and Mental Health Services Administration [SAMHSA], 2011). An estimated 68 million Americans engage in “risky” alcohol use or in drug use (Humphreys & McLellan, 2010). To determine “risky” alcohol or drug use, the National Institute on Alcohol Abuse and Alcoholism (NIAAA, 2010) established “low-risk” guidelines. The current NIAAA limits consider “risky” use of substances as more than four drinks per day and more than 14 drinks per week for men; more than three drinks per day and more than seven drinks per week for women and those over the age of 65; and any drug use, regardless of amount. Yet, even “low-risk” alcohol and drug use is not without risk to overall health and well-being (NIAAA, 2010). Health care professionals can help lower substance use risks by screening to identify and assess substance use in all health care settings. Screening, Brief Intervention, and Referral to Treatment (SBIRT) includes universal screening and brief intervention for patients with risky substance use, along with referral to treatment for patients who may have a substance use disorder and require specialty treatment. Through early screening and intervention, health care professionals have the opportunity to prevent patients from becoming dependent and—if a patient is already dependent—help him or her access appropriate care. SBIRT began to be formalized in the 1980s with the development of psychometrically sound screening tools and effective brief interventions based on motivational interviewing techniques (Babor et al., 2007; Bernstein, Bernstein, Stein, & Saitz, 2009). This included the study of brief advice by physicians for smoking cessation and work with risky drinkers. Also during the 1980s, the NIAAA and the World Health Organization conducted studies on brief interventions (Babor et al., 2007; Bernstein et al., 2009). Then in 2003, SAMHSA began funding a large portfolio of SBIRT intervention projects for state systems, colleges, tribal organizations, Federally Qualified Health Centers, and medical residency programs (Office of National Drug Control Policy, 2012). SBIRT has been associated with reductions in alcohol use, a decrease in health care utilization, and decreased societal costs (Cuijpers, Riper, & Lemmers, 2004; Kaner et al., 2009; Sullivan, Tetrault, Braithwaite, Turner, & Fiellin, 2011). SBIRT has become required and/or part of mandatory outcomes reporting by the American College of Surgeons, Commission on Accreditation of Rehabilitation Facilities, The Joint Commission, and the Veterans Health Administration and is billable through commercial insurance, Medicare, and Medicaid. Training nurses in SBIRT to address substance use in patients is ideal, because nurses spend the most time with patients (Richards & Hubbert, 2007) and are the most trusted professionals, according to public opinion (Jones, 2011). The Addiction Training for Nurses using SBIRT (ATN-SBIRT) curriculum was designed to prepare nursing students to apply an evidence-based screening and brief intervention approach for risky alcohol and drug use in their nursing practice (Burns et al., 2012). The methods of instruction included lecture, facilitated discussion, group and individual activities, simulation, and directly observed clinical practice from nursing instructors (both clinical faculty and community preceptors). The Figure illustrates the ATN-SBIRT curriculum as published in a case report (Burns et al., 2012). The 6-hour Addiction Training 101-SBIRT seminar presented during the junior year and 2-hour booster session in the senior year were designed to immerse undergraduate nursing students in knowledge about substance use disorders and SBIRT. Curriculum Modules 1 through 5, lasting approximately 2 hours, were designed to expose students to conceptual frameworks fostering understanding of the physiology of alcohol and drug use and the continuum of substance use, abuse, and dependence. These modules included the sociocultural contexts of substance use disorders and stigma surrounding and preventing access to treatment, the importance of linkage between general medical care and specialty addiction care, and stereotypes of people who use alcohol and drugs and how stereotypes affect care. Modules 6 and 7, lasting approximately 1.5 hours, exposed students to assessment and concepts of an evidence-based approach to screening and brief intervention. Other components of the immersion training included assessing a patient’s readiness to change based on the “stages of change” model (Prochaska & DiClemente, 1984) and role-play scenarios where students observed and then practiced SBIRT methods. Modules 8 and 9, lasting approximately 1.5 hours, explored the dimensions of effective treatment, the multiple paths to recovery, and how to make linkages to addiction treatment facilities and other community-based resources. These aspects of the curriculum emphasized the need for culturally competent care. Module 10, lasting approximately 1 hour, exposed students to professional and ethical concerns and professional resolution for the impaired nurse (e.g., a nurse with a problem related to alcohol or other drug misuse), a powerful preventive message to young pre-professionals. Finally, Module 11, taking place during clinical rotations and lasting approximately 3 hours, incorporated the hands-on, experiential dimension of the program with multiple opportunities for direct-observation practice of these new skills (Burns et al., 2012). The content of each module was jointly developed by trainers from the Institute for Research, Education and Training in Addictions (IRETA) and faculty from the University of Pitts-burgh School of Nursing. Screening, Brief Intervention, and Referral to Treatment curriculum. Adapted with permission from the ATN-SBIRT Curriculum table (Burns et al., 2012). The ATN-SBIRT program curriculum was developed and implemented via a 3-year grant funded by the Health Resources and Services Administration. It was developed through a partnership between IRETA, a nonprofit agency that brought expertise specifically in teaching and training related to addictions, and the University of Pittsburgh School of Nursing. The program prepared undergraduate nursing students to understand substance use across a continuum and apply SBIRT, an evidence-based screening and brief intervention approach, with patients to address and reduce risky alcohol and drug use. During the 3-year grant, issues that faculty encountered while implementing ATN-SBIRT were addressed through continuous quality improvement strategies such as reviewing the goals and objectives of the program and incorporating student and faculty feedback from biweekly program meetings and annual project retreats. During Year 1 of the grant, the ATN-SBIRT curriculum was finalized, faculty and clinical site instructors (preceptors) were trained using a train-the-trainer model, and junior-year students began receiving the curriculum and practicing SBIRT in their clinical rotations. More specifically, to deliver the educational component, the School of Nursing provided a train-the-trainer program to the faculty and clinical site instructors/preceptors before the beginning of the first term of implementation (Burns et al., 2012). The train-the-trainer program consisted of live face-to-face training for the core course and clinical faculty. During this program, the faculty reviewed the entire content of the curriculum and observed and conducted role-plays. Faculty and preceptors co-trained with University of Pittsburgh School of Nursing and IRETA expert trainers and had access to the curriculum, which contained training notes and additional citations and references. Later, during Year 3 of the grant project, a 1.5-hour online module was developed to train faculty and preceptors via distance learning, which also provided contact hours upon completion. Students first experienced the ATN-SBIRT program within the framework of the 15-week psychiatric-mental health nursing course taught during their junior year. The classroom component was followed by a series of clinical rotations in psychiatric-mental health, medical-surgical, obstetric, and geriatric settings. Clinical rotations took place in health care settings within the greater Pittsburgh area. The clinical locations have served as rotation sites for the School of Nursing for many years and will continue to do so with the addition of the SBIRT component. Students then continued to practice SBIRT during their 15-week clinical rotations in the above-named courses during their junior year and again through their 15-week clinical experience in the community nursing course in their senior year. During the clinical rotations, students performed SBIRT with patients while clinical instructors observed the students’ SBIRT skills, offered guidance to improve skills, and evaluated students on their use of SBIRT using a competency checklist. Additionally, in Years 2 and 3 of the grant, directed clinical scenarios were carried out in the simulation laboratory. The simulation exercises were designed to give students an opportunity to develop their skill in delivering culturally appropriate care, increase opportunities to practice SBIRT, and expand the clinical rotation capacity of the nursing program (Burns et al., 2012). Multiple case scenarios were presented to students during a 7.5-hour day in the simulation laboratory. Case scenarios were based on the American Nurses Association’s (2007) Psychiatric-Mental Health Nursing: Scope and Standards of Practice and included: (a) a middle-aged man with acute pancreatitis and alcohol withdrawal; (b) a young, pregnant woman with bipolar disorder and sporadic cigarette use; (c) an older man with congestive heart failure and a history of depression and previous overdose on tricyclic antidepressant agents; and (d) an older woman who was a victim of domestic violence with a dependence on prescription medications. These scenarios were further developed and refined collaboratively by the School of Nursing faculty and IRETA training staff to ensure the scenarios adequately addressed age, gender, race, and cultural issues. Simulations were videorecorded and used during student debriefings. The Dean and BSN Council at the University of Pittsburgh School of Nursing fully supported the implementation of the ATN-SBIRT project into the core curriculum for the undergraduate nursing program. Faculty members were provided time to attend the train-the-trainer program and learn about addiction and SBIRT while receiving contact hours. In addition, clinical instructors also received contact hours for the train-the-trainer program, ensuring that they were adequately prepared to provide technical assistance and oversight to students in use of SBIRT during clinical rotations and to sustain the content at the conclusion of the project. Throughout the 3-year curricular implementation, student participants were asked to complete evaluations providing School of Nursing faculty and IRETA staff with feedback regarding their satisfaction with the education and training experience, and faculty/community preceptors were asked to rate students on their SBIRT skills during the clinical rotations. Results from these evaluations are presented below. The participants for this study were 488 junior-year baccalaureate nursing students who completed a demographic survey and training satisfaction questionnaire immediately following the junior-year Addiction 101/SBIRT in-class seminar. The majority of the students were women (n = 429; 87.9%). Ten participants reported being Hispanic/Latino (2%). When asked about race, 437 reported being Caucasian (89.5%), 20 Asian (4.1%), 16 African American (3.3%), and 13 reported mixed or other (2.7%) (2 participants did not respond to this item). The mean age for the students trained was 22.9 (age range = 20 to 61). Student demographics and training satisfaction were measured via paper and pencil at three time points (pre, post, and follow up) using a training satisfaction survey previously developed by a federally funded addiction training and education center (Center for Substance Abuse Treatment, 2010). The pretraining survey administered prior to the Addiction 101/SBIRT in-class seminar included demographic questions and three items regarding trainee self-perceptions of their current knowledge and skills (i.e., “I have adequate knowledge in this training area”; “I possess the skills required in this topic area”; and “I am currently effective when working in this topic area”), scored on a 5-point Likert-type scale (strongly disagree, disagree, neutral, agree, and strongly agree). The posttraining survey was administered immediately after the in-class seminar and included 19 questions regarding satisfaction with training (including the 3 items on the pretraining survey), and 2 open-ended questions about the best and worst aspects of training. The follow-up survey was administered 30 days after the Addiction 101/SBIRT in-class seminar and included the same 3 items as on the pre- and post-survey. Student competency to provide SBIRT service was rated by clinical faculty and community preceptors via a rating form that was adapted from a form developed by the Commonwealth of Pennsylvania SBIRT Steering Committee and project staff at the end of a 5-year statewide SBIRT project in 2008. The rating form consists of eight items addressing different components of screening and brief intervention. Each item is rated on the following scale: 1 = not yet achieved adequate level of competence; 2 = needs additional training in the topic area; 3 = needs additional practice in the skill; and 4 = achieved adequate level of confidence. This study has exempt status through the University of Pittsburgh Institutional Review Board. Students were informed that completion of the surveys was voluntary, participation would not affect their course grade, and that their responses were confidential. The training satisfaction survey was administered to students via paper and pencil just prior to the Addiction 101/SBIRT in-class seminar, immediately following the end of the seminar, and 30 days later. The Competency Rating Form was completed by faculty or community preceptors during clinical rotations following students’ participation in the Addiction 101/SBIRT in-class seminar. Results of the posttraining satisfaction survey are presented in Table 1 and Table 2. Responses were overwhelmingly positive regarding the in-class seminar. The majority of participants responded that they were satisfied with the overall quality of the training and training experience and the quality of the instruction and training materials. More than 90% of the students strongly agreed or agreed with statements related to the class being well organized; the usefulness of materials; and instructor knowledge, preparedness, and receptivity. In addition, more than 90% of the students strongly agreed or agreed that the training enhanced their skills, was relevant to their career and to substance abuse treatment, and would benefit their patients and that they expected to use the information. More than 80% of students strongly agreed or agreed that they would recommend the training to a colleague. Finally, 95% of students (442 of 466 responding to this item) reported that the information they received from the instructor was very useful or useful (not reported in table). Table 3 presents results of three items that were repeated in the pre-, post-, and 30-day follow-up surveys. Because the items do not constitute a subscale and because they are scored on a Likert-scale (rather than being continuous), some precaution needs to be taken when examining change over time. However, results of Wilcoxon signed rank tests indicate that students perceived increased adequacy in their knowledge, skills, and effectiveness related to delivering SBIRT from pre- to post-seminar (Z = −14.35, p < 0.001; Z = −13.21, p < 0.001; Z = −12.13, p < 0.001, respectively). From postseminar to 30-day follow up, perceptions that students had adequate knowledge and skills required significantly decreased, whereas perceptions of effectiveness did not change (Z = −4.40, p < 0.001; Z = −3.77, p < 0.001; Z = −0.05, ns, respectively). Table 4 presents the results of the Competency Rating Form. As a sign of the effectiveness of the in-class seminar in providing didactic instruction, very few students (i.e., less than 4% per item) were rated as needing additional training in the topic area. A majority of students were rated as having achieved adequate level of competence on items pertaining to administration of initial screening items, engagement of patients in screening, and appropriate administration and scoring of the screening. On the other items, the majority of students were rated as “needs additional practice in the skill” (e.g., items pertaining to integrating screening as part of the visit, accurately interpreting clinical/risk level and responding, applying stages of change model, demonstrating correct clinical approach, and collaborating with patient on best course of action). The SBIRT curriculum project’s results indicate that undergraduate nursing students were satisfied with the overall quality of the SBIRT training, quality of the instruction, training materials, and experience (Table 1). The educational methodology used (didactic, simulation, and clinical SBIRT educational experiences) were effective in changing the undergraduate nursing students’ self-perceptions of their knowledge, skills, and effectiveness in screening and intervening for hazardous alcohol and drug use following the SBIRT educational experience. Most, but not all, students retained this perception at 30-day follow-up, suggesting that these perceptions are carried beyond the training period. Faculty and clinical preceptor ratings of student skills at performing SBIRT during clinical rotations also confirm that almost all students had an adequate knowledge level. The result that some students’ self-perceptions of having adequate knowledge and skills decreased 30 days posttraining may reveal that “the more you know, the more you don’t know.” Many of these students would have had the opportunity to implement SBIRT with an actual patient and within a clinical area. As with any new skill acquisition, practice will help maintain and solidify skill, but perhaps the students did not receive enough practice to report that they had sustained knowledge and skills at the time of survey assessment. Perhaps too, as Dreyfus (2004) pointed out, progression from “novice to expert” is incremental but not necessarily linear or stepwise. That is, there will be plateaus, setbacks, stagnation, or occasional leaps forward (Dreyfus, 2004). Students reported that their knowledge increased following the SBIRT curriculum, the skills they possessed increased, and they felt more effective in using SBIRT following the training. However, compared to self-ratings of knowledge and skills (69% and 65%, respectively), fewer students (44%) reported they strongly agree or agree that they were effective working in the topic area (i.e., substance use and SBIRT). This result emphasizes the importance of supervised clinical application as part of the program and warrants consideration during the program’s curriculum review and quality improvement activities. Actual ratings of students’ clinical practice support this finding. Although faculty/preceptors rated most students as achieving an adequate level of competence in delivering the standardized screening, most students were rated as requiring additional practice in delivering the brief intervention components of SBIRT. This clinical rating indicates that the translation of classroom knowledge to clinical application requires additional focus on SBIRT during clinical rotations to ensure the students’ self-reported need for practice to enhance skill, effectiveness, and competence occurs (Table 3 and Table 4). Self-report measures were used for demographics and training satisfaction, and faculty completed the Competency Rating Form to assess student skills. This project was designed as a curriculum enhancement to implement risky substance use and SBIRT training into an undergraduate nursing school curriculum. Although nearly 500 nursing students were trained, the project was limited in ensuring that every student had multiple clinical opportunities for skill practice and development. Future projects should focus not only on embedding addiction and SBIRT education into undergraduate nursing education but also enhancing opportunities for continued practice and skill development. The University of Pittsburgh School of Nursing will continue to develop clinical opportunities within the curriculum for students to apply these new skills. This project demonstrates that nursing students are an appropriate pre-professional group to target for SBIRT training and skill development (Richards & Hubbert, 2007). The participating nursing students in this project (N = 488) reported satisfaction with the training and perceived SBIRT to be relevant to their careers. The more nurses who learn and practice the SBIRT model, the greater the opportunity to improve public health and decrease future health care costs associated with the 65 million Americans who engage in risky alcohol or drug use (Broyles & Gordon, 2010; Humphreys & McLellan, 2010). Implications from this ATN-SBIRT curriculum infusion project suggest that undergraduate nursing students are tremendously positive toward learning SBIRT, were satisfied with the topic and training instruction, and perceived that their skills increased following the training. In addition, undergraduate nursing students believed that learning SBIRT was relevant to their careers (93%) and would benefit their patients (91%). These results suggest that students of other schools of nursing would benefit from a curriculum that embeds significant training on substance use disorders and SBIRT and would address the gap in existing nursing school curricula (Annapolis Coalition, 2007; Gordon & Alford, 2012). Additionally, the ATN-SBIRT program provides a feasible implementation model to increase the ability of nursing students to apply an evidence-based practice to address hazardous alcohol and substance use as part of a routine medical encounter. Further emphasis on clinical practice is recommended. American Nurses Association. (2007). Psychiatric-mental health nursing: Scope and standards of practice. Washington, DC: Author. Hoffman, A.L. & Heinemann, M.E. (1987). Substance abuse education in schools of nursing: A national survey. Journal of Nursing Education, 26, 282–287. Howard, M.O., Walker, R.D., Walker, P.S. & Suchinksy, R.T. (1997). Alcohol and drug education in schools of nursing. Journal of Alcohol and Drug Education, 42, 54–80. Prochaska, J.O. & DiClemente, C.C. (1984). The transtheoretical approach: Crossing traditional boundaries of therapy. Homewood, IL: Dow Jones-Irwin. Mitchell, A.M., Puskar, K., Hagle, H., Gotham, H.J., Talcott, K.S., Fioravanti, M. & Burns, H.K. (2013). Screening, Brief Intervention, and Referral to Treatment: Overview of and Student Satisfaction with an Undergraduate Addiction Training Program for Nurses. Journal of Psychosocial Nursing and Mental Health Services, 51(10), 29–37. Screening, Brief Intervention, and Referral to Treatment (SBIRT) includes universal screening and brief intervention for patients with risky substance use, along with referral to treatment for patients who may have a substance use disorder and require specialty treatment. The Addiction Training for Nurses using SBIRT (ATN-SBIRT) curriculum was designed to prepare nursing students to apply an evidence-based screening and brief intervention approach for patients’ risky alcohol and drug use in their nursing practice. The SBIRT curriculum project’s results indicate that undergraduate nursing students were satisfied with the overall quality of the SBIRT training, quality of the instruction, training materials, and experience. Although faculty/preceptors rated most students as achieving an adequate level of competence in delivering the standardized screening, most students were rated as requiring additional practice in delivering the brief intervention components of SBIRT. Send an e-mail to the Journal at jpn@healio.com.